Glen is marking out an electric line as Jason follows picking up his marks with GPS. Sometimes paint and flags don't last as long as people would like them to. We are now capable of providing you with GPS coordinates of your underground utility locate. If you work in a place far away from us this might be right for you. This client decided rather then having us come so far just for little jobs here and there. They would rather have us come to mark and GPS everything once. 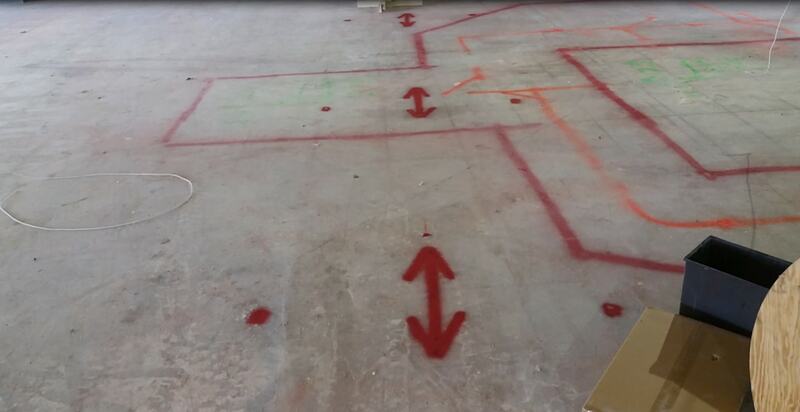 Red arrows show where an electrical conduit runs beneath the slab floor. This client was going to saw cut through the slab in order to put in some new plumming. We located a major power line running right through where they were going to cut. 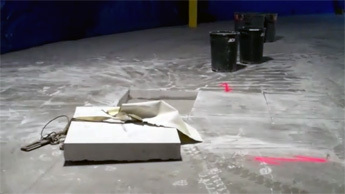 Conduits can be embedded right in concrete slabs. Making even just drilling a small hole into a floor dangerous without knowing where conduits are located first. Alot of people don't realize that most underground utilities in mobile home parks are private utilities, and will not be covered by a Digsafe call. 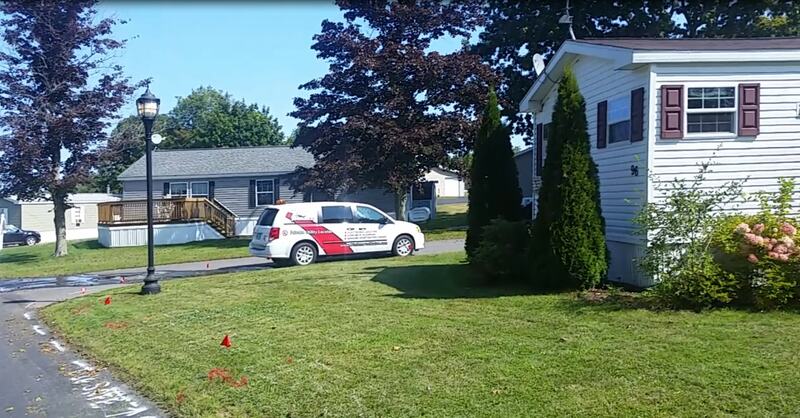 Legally you still must call Digsafe prior to digging, but if you live in a mobile home park or manage one know that we are the ones who will come locate your utilities after Digsafe has done it's part. 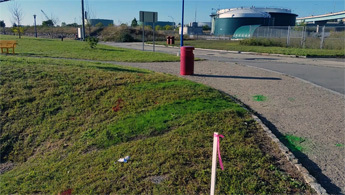 Green arrows show a drainline. Red paint and flags represent electrical conduits. 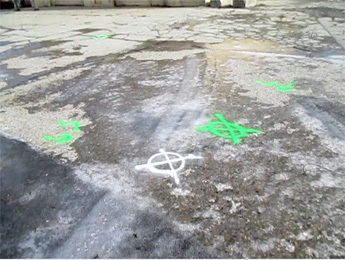 The white premarks indicate where our client is going to probe the ground to research it's soils. Several maps of underground utilities were given to us prior to this locate. The drain line which goes throught the edge of these premarks were not on any of our maps. Having up to date maps is crucial when you manage a large facility like a hospital. 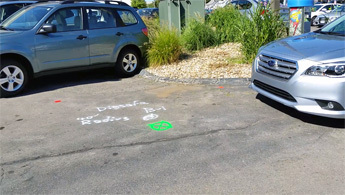 Using us to identify all underground utilities on a site can help surveyors make accurate maps and save time and money in the long run. They were planninig to do some road regrading and were unsure of the whereabouts of the electric lines running to and from wind turbines. You can hit a utility line doing all sorts of things. Not just digging. We go near and far for our clients. Wether it's just down the road or high up in the mountains. Busy streets and dirt roads. We strive to help anyone we can with their locating needs. We do all sorts of work on dams. From concrete scans to utility locating. New or old. Big or small. There are no types of construction sites we don't go to! Large UST and its components, along with power conduits. This underground storage tank was leaking, and had to be decommissioned. We did a complete subsurface survey around this UST to clear soil borings and help the engineers determine the best course of action for their project. Utility river crossing locate in progress. We used a submersible electromagnetic locator to find several oil pipelines crossing this river, and measured the depth at which the pipes were buried below the river floor. The corridnates were also gathered for each depth reading with GPS. Communication duct bank is marked in orange. Electric duct bank is marked in red. Construction on private property can be hazardous if you don't know where utilities are located. These are major duct banks that were not marked out by a Digsafe call. Working closely with contractors and good communication are the keys to a safe digging project. UST marked in yellow surrounded by power and communication lines. 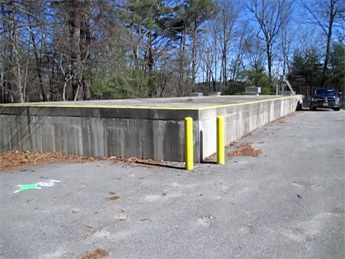 We used Ground Penetrating Radar to find this underground storage tank which is planned to be removed. The red and orange paint indicates power and communication lines that we also found using electromagnetic locating equiptment. This looks like a tough UST to get out of the ground, but at least they know what they're dealing with now. Red paint shows where the buried electrical conduit runs through the concrete floor. We used electronic locating to find and mark the locations of electrical conduit embedded in the concrete floor of this Maine bottling plant. Using ground-penetrating radar, we verified that the conduits were buried at depths between one-and-a-half and two feet. 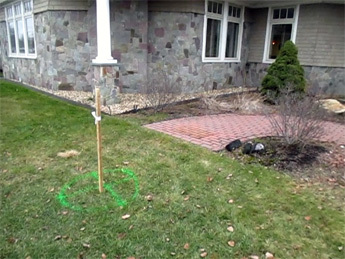 Original borehole target in white; safe borehole target in green. Many test borings were planned for this car dealer's lot, and we ended up moving several of them out of harm's way. One of the targets we adjusted happened to fall directly on top of a large drain line. Another bore target was close to a perimeter drain running along the far side of a retaining wall. We moved a third target as much as eight feet, as it was very close to buried electrical power and irrigation controls. Very busy hospital lot, with safe borehole targets marked. At this Massachusetts hospital, we were asked to locate an underground tank and clear some soil borings. We found a diesel tank and the line running to it, sewer lines, and several service lines. Even though the area was full of utilities, we were able to find safe bore targets. 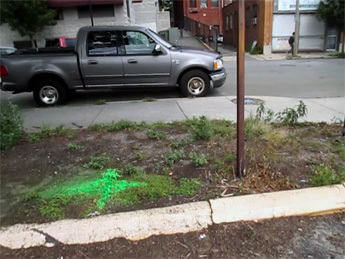 Several bore targets in a parking lot – targets we safed are in green. We found quite a few underground anomalies throughout this large area. We discovered evidence of old excavation to remove an underground tank at some point, too. Still, we wee able to clear all of the boring locations. 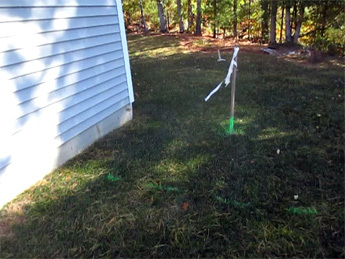 This test borehole location straddles the area between buried electrical and drain lines. We were tasked to clear four boring locations at this Rhode Island plant. We found a power line for a light pole crossing within 15 feet of the bores, which we marked it for the crew's reference. 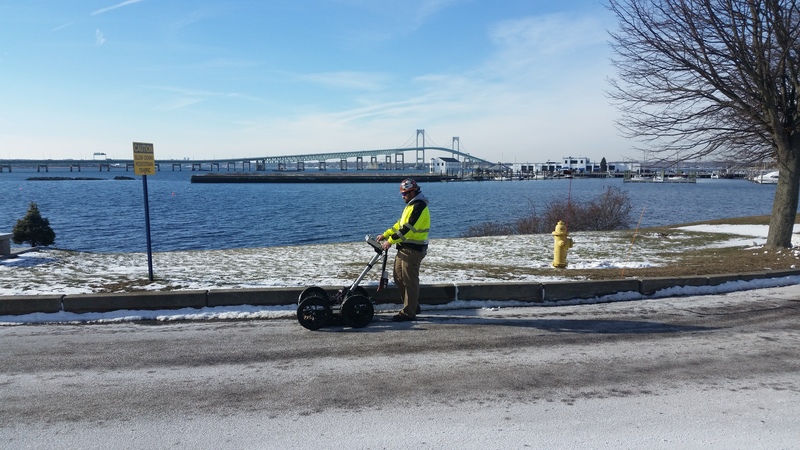 Using ground-penetrating radar we also traced a small anomaly running along the curb – we suspect it's a drain line, which would be worth missing. Another bore target elsewhere on the site was directly on top of another drain line, so we moved the target to avoid it. A safe borehole target near the corner of the house. Several bore targets were proposed for this house lot in New Hampshire. We found a propane tank with a buried copper line connecting it to the house: one of the original bore targets was directly on top of the propane line, so we moved it about four feet away. We also located some PVC pipes, but they weren't in the way. A new building was going up at this Massachusetts plant, and we were called in to clear some boreholes. We checked the site and all the borehole locations were clear – the nearest utility was a water main which we located and marked, just to be safe. 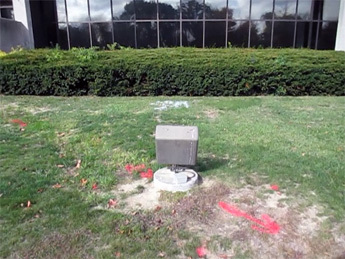 Red paint shows the path of electrical conduit leading to exterior lighting. 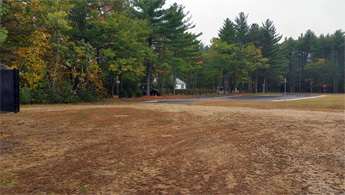 Several boreholes needed clearing at this Massachusetts location. After scanning the area, we found one buried anomaly which led to the utility vault. We also found and marked a buried electrical cable. The area was otherwise clear. Even a large and seemingly empty area like this can have utilities hiding below ground. This facility in New York had several boreholes that needed to be cleared. Three of the bore locations shown on the site plan were not marked out, so we located the GPS coordinates of each. Clear bore site dodging electrical and sewer lines. The lot at this Massachusetts dealership had several boresites to clear. We located and marked the power lines leading to the light poles and the vacuums, and we also found the main service coming into the building from the transformer. 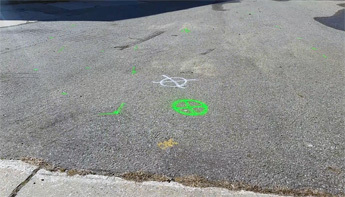 One of the boring targets needed to be moved about ten feet to avoid water and sewer lines – the original target was directly above the sanitary sewer line. A cleared and flagged bore site next to a clarifier. 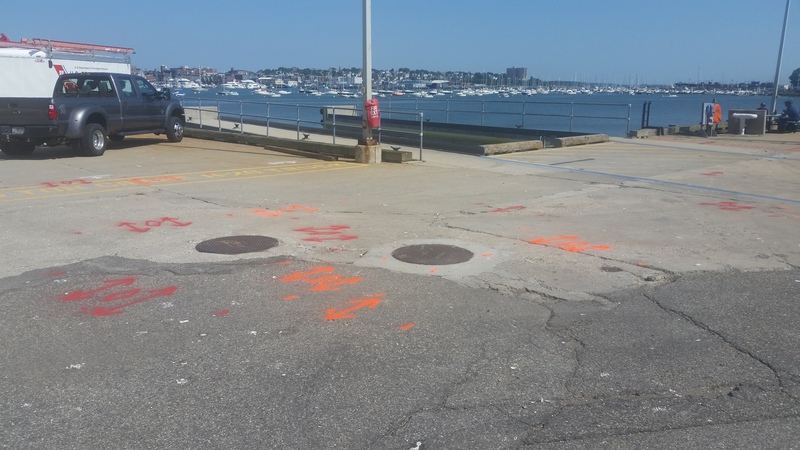 We were asked to clear several boresites at a sewage treatment plant in Rhode Island. We found a number of buried pipes next to a clarifier, but we were able to verify that the proposed boresites would avoid them. Safe bore hole location next to a residence. We cleared several boresites at this New Hampshire residence. One site was directly above a line buried three feet beneath the surface, so we moved it a bit to avoid the line. We also found a copper propane line connecting the residence to an underground propane tank. We found evidence of a buried plastic water pipe in the front yard and recommended the crew examine the basement of the house to make sure there would be nothing in the way. 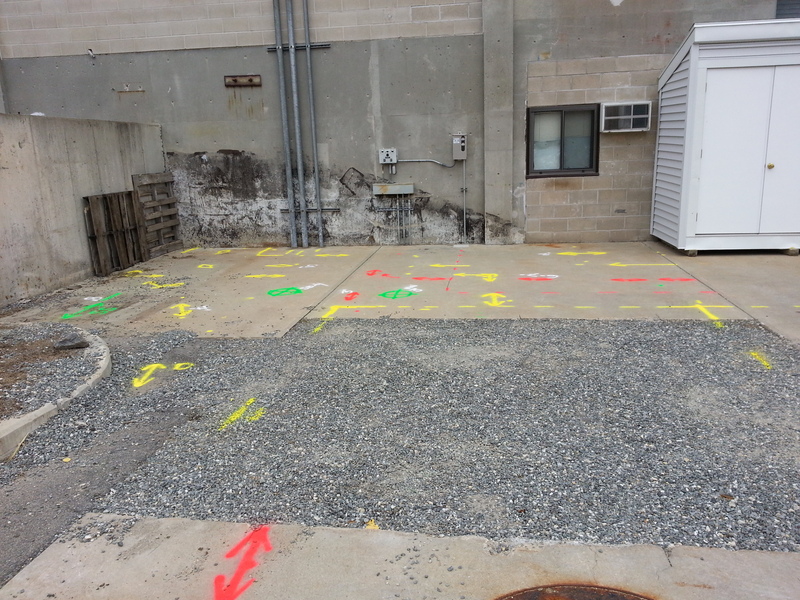 Marks showing electrical lines leading to a cable vault at a substation. 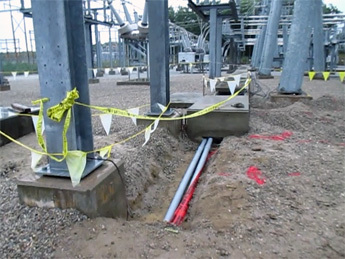 An electric utility was planning to lay more conduit at one of their New Hampshire substations, but needed to know what lines were already buried there. 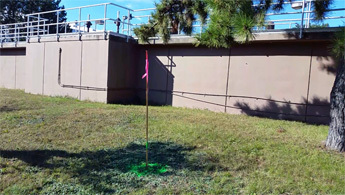 Using ground-penetrating radar and electronic locating, we found all of the existing conduit connected to the cable vault – including several lines that stretched up the hill to another substation – as well as the large grounding grid. We also verified that some utilities that were present on the site plan didn't actually exist, so the customer was able to update their plans. 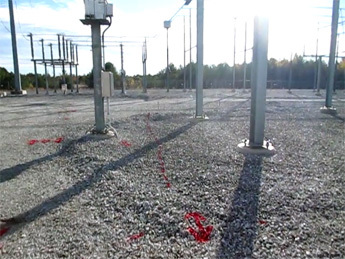 Red paint on the ground showing the locations of several buried electrical cables. 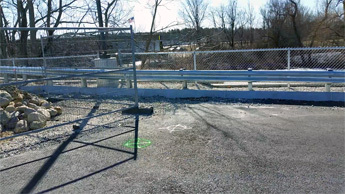 At this New Hampshire substation, we cleared an area for the installation of two new beams. 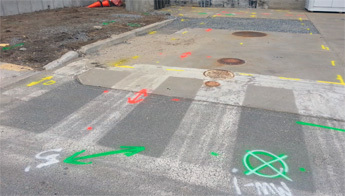 Using GPR and electronic locating, we found and marked the layout of the ground grid in red hash marks, and also found and marked a conduit that was dangerously close to the work area. 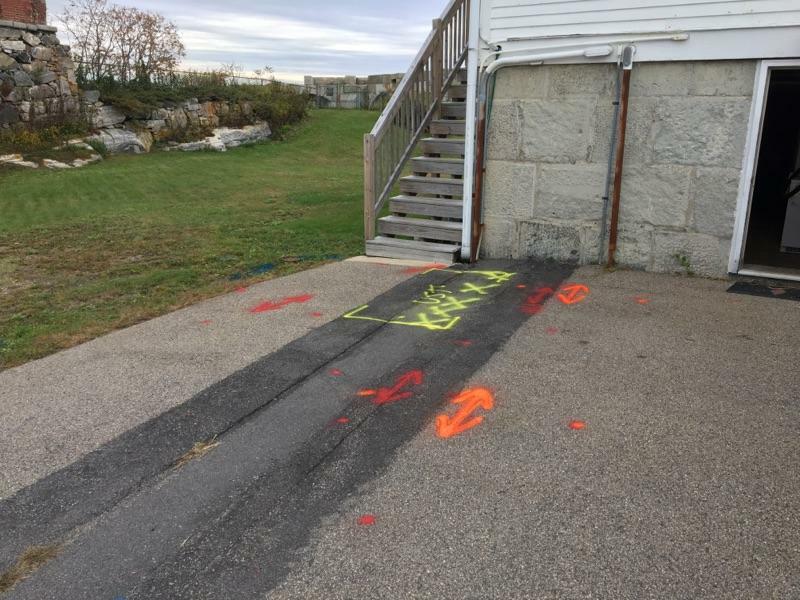 In another area of the same substation, we found and marked a number of underground lines extending from the cable vault in all directions. The new bore target that will miss nearby underground utilities. At this Massachusetts location, we were asked to clear a bore site. Good thing, too – we discovered an obstruction underneath the original target area. We moved the bore target a few feet to the right, and the test boring was able to go without a hitch. Several safe bore targets in a parking lot. 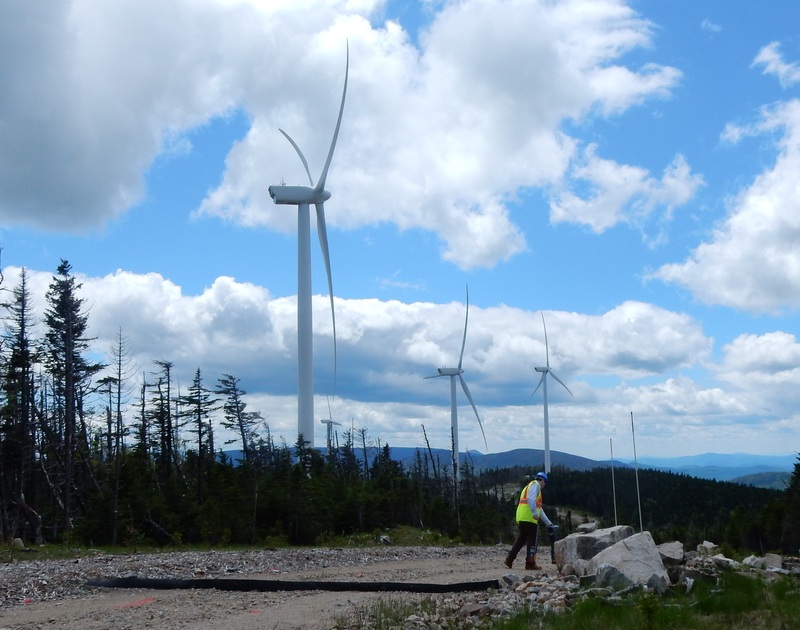 This New Hampshire site is being redeveloped, and we were asked to clear nearly twenty test boring sites. We discovered evidence that a gas pump pad might have once existed on the site, as well as underground tank(s) for the gas. We moved a few of the bore targets to avoid suspicious underground anomalies. 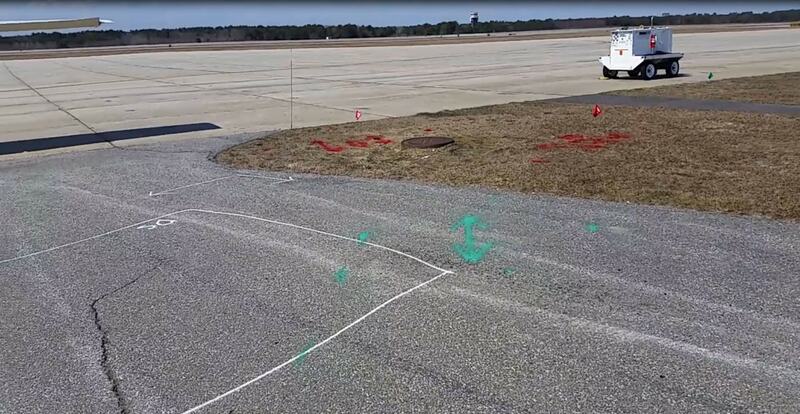 We verified that both the gas pump lines and the underground tanks had been removed, but we could still see where they had once been by the ground disturbances that showed up on our ground-penetrating radar.